Bustled through Singapore Airpot like a boss, I departed the airport via immigration collected my bag, found arrivals checked my bag in and back in via security check & immigration (as you do but probably shouldn't have to) before dashing back to the Terminal 1 for the next brief flight to KL remembered only for its particularly bad coffee. I had just over a day there and spent it with two friends eating and talking and then talking about eating. From the very first moment KL proved friendly-- we met a young Chinese women, sitting on a bench eating her mothers home made lunch. Within five minutes we were test tasting a significant portion of her lunchbox and swopping recipes. And that set the tone for the time in KL - serious discussions regarding food. We had street food in the back streets, wobbly plastic tables and vendors lording it over huge fire-spewing gas rings with cauldrons of bubbling broths and layers of chicken skewers over charcoal grills. There were vats of satay sauce, bbqed chicken wings and fabulous fried kway teow being created, Every mouthful a taste sensation. People milling around, eating, laughter and stories in other languages being told. 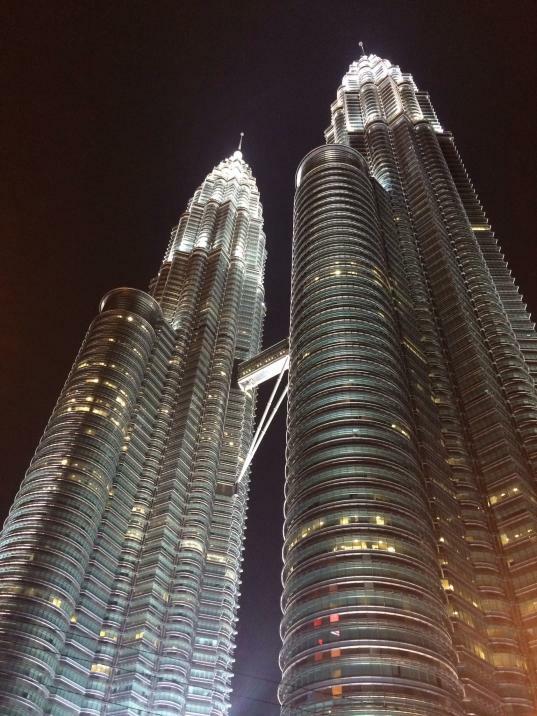 We saw KL's twin towers at night lit up like diamond jewelled spires, and awkward selfies trying to fit both us and the towers in. The place where Kl began - the name meaning "muddy confluence " is now a place of fabulous historic buildings with rows of beautiful arched windows lit up. Streets so pretty, lights hanging from trees in rainbows of colours, and more people sitting and gossiping and enjoying the moments. Time slipped by quickly and I was mentally calculating how long I had been awake for and the time at home (3am) and Eng says "I know a great place for "poured milk chai" and so we went there too, along with all the other locals and sat and laughed and discussed and pondered the things you ponder when you are so tired your brain stops working despite a healthy dose of sugar and tea leaves! We breakfasted Yum Cha style and I got as close as I could to the kitchens and watched the chefs steam and fry and stuff wonton pastries, mix together bowls of deliciousness and the dearest waitress with a huge crooked smile took me under her wing for "show and tell" and persuaded me to sample even more delicacies. It wasn't too long before discussions of the next meal began and again, a place found in a side street with amazing food, chaotic service and intense conversations on which method would be best to prepare crabs. . We eat at one of many tables on the street and as each table finishes the staff come and grab the table cloth and all that is on it (plastic ware, food remnants, cutlery ) and take it to a huge tub and empty it in, the cloth discarded on the floor. I went walking near the kitchen, separated from the street by roaring gas fires and 2 stray cats. It's fast and furious eatery with men in sweaty Tshirts ladling oils and stocks flavourings and greens, meats and noodles into woks - sizzling food and roaring fires and close by the 4 women squatting under a lean too tent on the street washing the constant flow of dishes laughed at me. They take their food seriously these Chinese Malay people and I feel I've accidentally stumbled on a food tour more than anything else. Eng is an author and was a lawyer and together with one of my dearest indian friends they filled every moment not taken with food with discussions on politics, wisdom, language, countries, funny stories, cultures, challenging preset ideas and wondering how to change the worlds we love one step at a time. All too quickly its fond farewells as we all go our different ways and for me it's back to the airport and the first of two seven- hour flights. A quick stop over in Dubai - 41 degrees out and a mass of gates and lounges and perfumed duty free shopping within before finally doing the last leg through the time zones. It's after 9pm when i arrive in Barcaloma - soft European dusk and it's an easy entry into Spain (always odd compared to my Australia's rigid border security!) An airport shuttle bus drops me at Catalunya Square and totally disorientated with no visual clues ( Dear Spain please put up some street signs) and distracted by incredible water fountains, huge glossy bubbles floating by, street markets and a particularly amazing gelato shop I waundered around vaguely hoping to find my hotel. Finally with the help of friendly locals the H10 was found and the bubbly welcome drink, hot shower and crisp white sheets have all blended into one happy sigh. Outside the balcony shutters is a world to explore!